Voting is a right, and those qualified to do so have no reason to be intimidated or scared away — even if the person who hands them the ballot is packing heat. 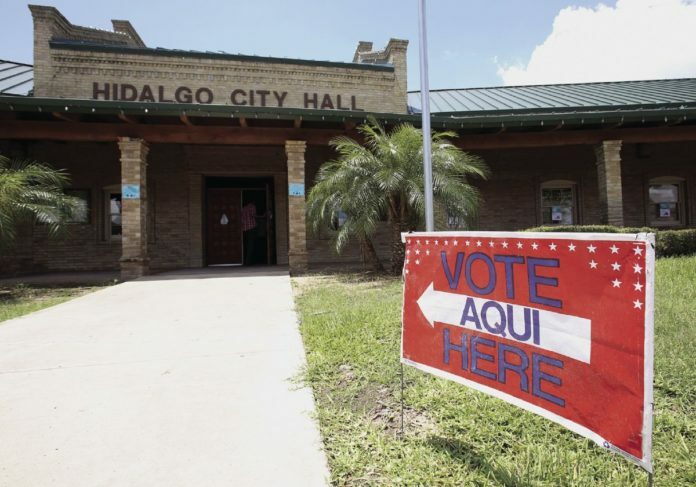 Early voting begins Monday for the Nov. 6 midterm elections. It’s an important election; in addition to key local races, all members of the Houses of Representatives in both the state legislature and Congress are on the ballot, as are one U.S. Senate seat and several major state offices. Intimidation could be the purpose, if not the effect, of a recent ruling by Texas Attorney General Ken Paxton. He received a query by state Rep. James White, R-Woodville, who asked if election judges could carry weapons during the elections process. However, Paxton noted that one of the duties of an elections judge is to “preserve order and prevent breaches of the peace and violations” of voting laws and procedures. This, the attorney general reasoned, makes them de facto peace officers. He also cited a 1913 court ruling that the elections judge at a polling lo-cation has the same authority as a district judge. Because district judges can be armed, then an elections judge can also, Paxton ruled. He obviously recognized weaknesses in his ruling, such as the fact that many laws have changed since 1913 and that peace officers must be appropriately trained and certified. Only elections judges with handgun permits can carry weapons, and they cannot have them at locations that prohibit all weapons, such as posted private property or colleges that chose not to allow weapons on campus. We know of no instances of polling site violence, even in instances when lines have been unusually long, ballots have run out or equipment has malfunctioned. Arming elections judges appears to be a solution without a problem. Since taking control of state government, the Republican leadership systematically has imposed roadblocks on our elections process. It has required that voters carry specific forms of identification in addition to voting credentials; in some areas they have shortened early voting days and eliminated polling sites; some already have posted armed security guards outside of the entrances to elections locations. Arming elections judges appears to be one more attempt to scare voters away. Our form of representative government depends on voter participation; our founders described it as government by the governed — we decide who will represent us and make key decisions on our behalf in our seats of government. Voters should not allow anyone to dissuade or intimidate them into not casting a ballot.